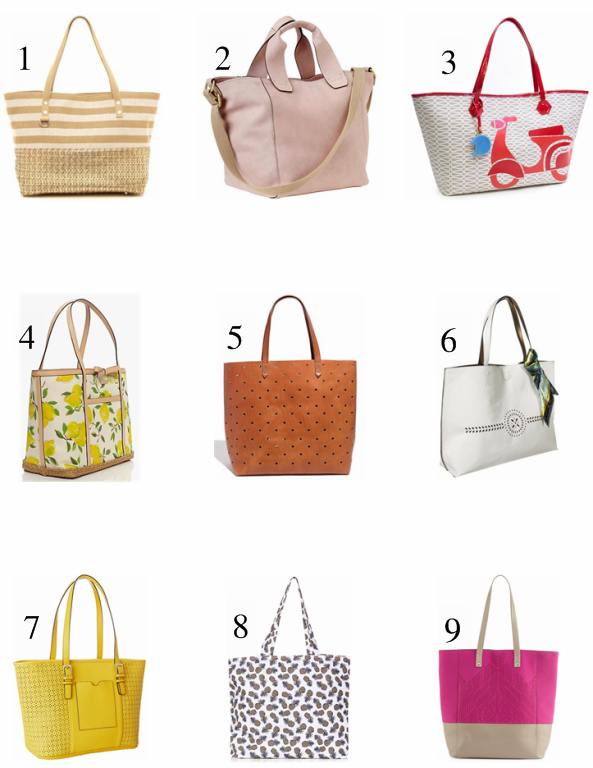 Picking fresh flowers at the farmer's market, picnicking in the park, trips to the shore--spring has sprung, so it's the perfect time to get a good tote bag. 1. I'm in love with the metallic gold crochet, obviously. 2. The palest of pale pinks. 3. The scooter just screams springtime, doesn't it? 4. A printed tote with lots of pretty details and plenty of room. 5. Perforations breathe new life into a simple leather bag. 6. A crisp white bag with a ladylike scarf. 7. The perfect springtime tote, the color of daffodils. 8. The pineapple print is just adarable. 9. Neon pink and tan--the coolest color combo.